Holistic means we treat the whole person. Located in beautiful and serene Sedona, Arizona, our residential program offers a holistic alternative to traditional mental health and addiction treatment. We specialize in offering alternatives to medication and addressing the neurochemistry of addiction, all in a peaceful, therapeutic environment. Our integrative approach utilizes evidence based methods to treat every part of the individual. Residents of the program address the physical, mental, emotional, and spiritual aspects of their healing journey. It’s an unexpected phenomenon. Realizing that the very method you’ve chosen to help ease health ailments or remove both physical and emotional pain is often the source of your discomfort. This is the story of so many, like you, now questioning traditional medicine or dependent on drugs. Here’s where life moves forward. We have found that it takes a different path to find answers. In this video, you’ll get a better understanding of who we are, why we’re here, what we stand for and how our approach to healing not only makes sense but is based on science. Fresh starts begin inside our doors. Get a glimpse of our comfortable facility and compassionate, fully-licensed staff there to help ease the process of medication withdrawals and detox and guide towards the solution that works best for you. Through a wholly integrative approach, we assess and monitor each client and design a treatment program that supports individual well-being. We focus on uncovering the root cause(s) of dependency and through holistic practices, rebalance neurobiology and physiology creating a sustainable, natural path of recovery. We believe each person is unique and their treatment should reflect that. Each individual’s treatment is specifically tailored to fit their needs. The universe didn’t intend for us to depend on drugs. You’re already on the right track if you’re here, searching for answers. If you or a loved one is considering getting off prescription medications, recreational drugs or alcohol, make sure you begin a program managed by medical practitioners. There are side effects and other risks that can cause undue harm. We address the symptoms and side effects of withdrawal through orthomolecular medicine, lab testing, investigative processes and more. We also offer mental health disorders treatment, since these are closely intertwined with addiction and should be addressed concurrently. 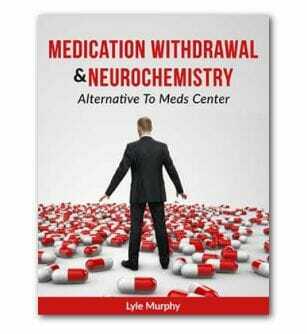 Recreational drug withdrawal brings out myriad possible symptoms. Recovery is often short lived unless we address addictive biochemistry. Alcohol withdrawal can lead to delirium tremens, which can be deadly. Expert, customized treatment is needed to mitigate the effects. Our treatment program for antidepressant withdrawal specializes in tapering people off these drugs at a rate that they can endure. We approach opiate withdrawal by keeping the client stable and paying special attention to alleviating the biochemical-physical cravings. We treat benzodiazepine withdrawal through careful tapering protocols, cleansing of neurotoxins, counseling and holistic therapies. Subscribe to our newsletter to get monthly updates on Alternative to Meds and advancements in addiction treatment and holistic therapies. The truth lies where theory and fact align, and further brought to light through the patients we serve. Substantive treatments and comprehensive healing methodologies come about with due diligence in research and reporting. All of our programs are evidence-based, backed by science and continuously fine-tuned as new technologies and findings emerge. Open yourself up to a whole, new world of well-being. Download one of our ebooks today by clicking on the buttons to the right, or see all our resources below.